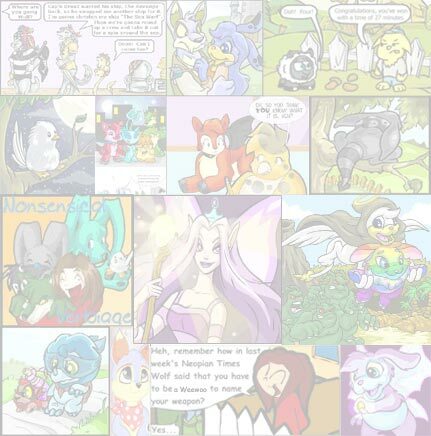 "What kind of NeoPet are you? Take this quiz and see!" I smiled at the Neomail on my screen. It looked like one of those chain letter/mini quizzes that always bounced around in the Neomail Fill it out and send it to your friends; that kind of thing. This one seemed harmless enough, since it wasn't asking for anything. I figured it would be fun to do so I started answering the questions. "1) You make friends and�" I found myself associating with option f) more than any other letter. Finally I was finished and scrolled down to the bottom. "If you got mostly f): Eyrie. You are playful and friendly, but also strong. Messing with you is a bad idea, but it's hard to get on your bad side. You are an intellectual and think things though." "Now that you know what kind of pet you are, pick your favourite colour of that pet. 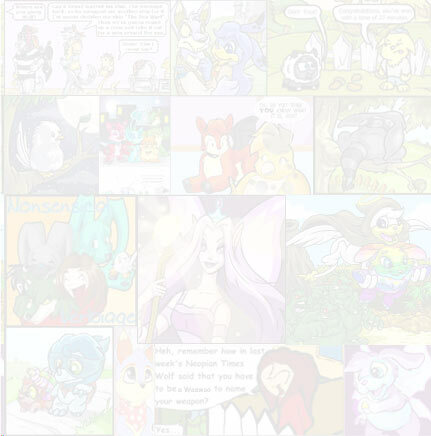 Then send this to your Neofriends so they can find out what NeoPet they are." I scrolled through the colours, and then decided that I liked the Electric Blue on the Eyries. I clicked the "send" button and sent a copy to my best Neofriend so she could fill it out. Something was wrong. My hands were starting to tingle, and they weren't working right. I looked down and gave a yell of alarm as my hands began to get fuzzy and turn blue. Within seconds they had changed into lion paws and the effect was spreading quickly up my arms. Then the pulling started. I struggled, trying to pull back from the computer, but whatever it was had a very strong grip. I was pulled through the screen and suddenly found myself falling through the air toward a nice looking neighbourhood. I gave a yell, which changed into an eagle screech, and I tried to slow my fall. Massive eagle wings sprouted from my back and beat at the air frantically. My fall slowed but my rapidly changing body was messing me up. I was growing heavier as well as bigger, so even though I slowed down, I still ended up landing in a heap in the front yard of a NeoHome. An irritated voice barked, "Hey, if you can't fly, why the heck were you given wings?" I looked up to see a tough looking cloud Lupe standing in the doorway. Two Gelerts and a Poogle peered around her. My newly formed beak dropped open. They were my pets! Alkuna, my Lupe, LaCody and Mercolagos my Gelerts and Vhai my faerie Poogle! "Alkuna?" I got to my wobbly paws and stared at her. She did a double take at me, and then gasped, "M-mum? What's happened to you?" They raced out and hugged me tightly, then began examining me from beak to tail tip. "You look pretty," Vhai told me, "But you looked prettier before. Why did you change?" I explained to them about the Neomail we had gotten. Alkuna and Mercolagos exchanged glances and led me inside. We looked over our Neomail and discovered the person who had sent it. I hadn't checked before and felt kind of foolish for it. It was sent from somebody named Atera. "Rhiow is an evil creature. She may look like an Aisha, but she is very different inside! She is Atera's (Dark Faerie) servant/pet. Her magic is all dark, making her one of the most powerful pets." I swallowed hard, "The Dark Faerie did this? We'd better tell the Faerie Queen then." I started for the door, and then gasped. "Luvinnemiousis! My Neofriend! Oh no! I sent her a copy of the spell trapped Neomail!" Alkuna led the way through the streets. She knew quite well the way to my friend's NeoHome; her husband, SilverBlur lived there. I heard a yowling even as I turned the corner that led to her street. A faerie Kougra was pacing around in the front yard of her two story home, while SilverBlur tried to calm her and her Zafara, Serifinan, her Cybunny, Mickey_Maestro, and her Techo, RoyalNP peered out from their prospective hiding places. She whirled around when she saw us, then stared at me in horror. She recognised me because my pets refused to walk around with anyone else. "You too?" she gasped, "Oh no. How are we going to get back to our human selves?" I sat awkwardly on my lion hind paws and shrugged my big shoulders, making my wings rustle, "I got the Neomail from Atera, also known as the Dark Faerie. Whatever she's up to, we'd better warn the Faerie Queen. If more owners start turning into pets, there won't be enough humans left to direct the pets. Which I'll bet is exactly what Atera's counting on." She shook her head, "No wonder you're an Eyrie. Good thing we have wings." She looked somewhat uncertainly at her own purple wings. "I, uh, guess we can fly. They certainly slowed my fall on the way here..."
I am a fan of many, many Neopians here.